There are those occasions when you need a big bag – a really big bag. Now, you could certainly just go out and buy a nylon or cotton behemoth, which will easily get the job done. But, what if you plan on carrying this big bag for a long time and want to do it in style? Well, you stumble onto the vast array of leather bags. And, when you do you find that there are a myriad of bag makers and bags that come in every size, shape, and style. But, if you’re looking for a large briefcase, it narrows the options down quickly. One of those large briefcase/messenger bag manufacturers is LederMann. Since 2002 LederMann has been making high quality products using full grain leather, old world craftsmanship, and strict quality control. The result are bags, briefcases, travel bags, and backpacks designed to be durable, serve you well, and stand the test of time. 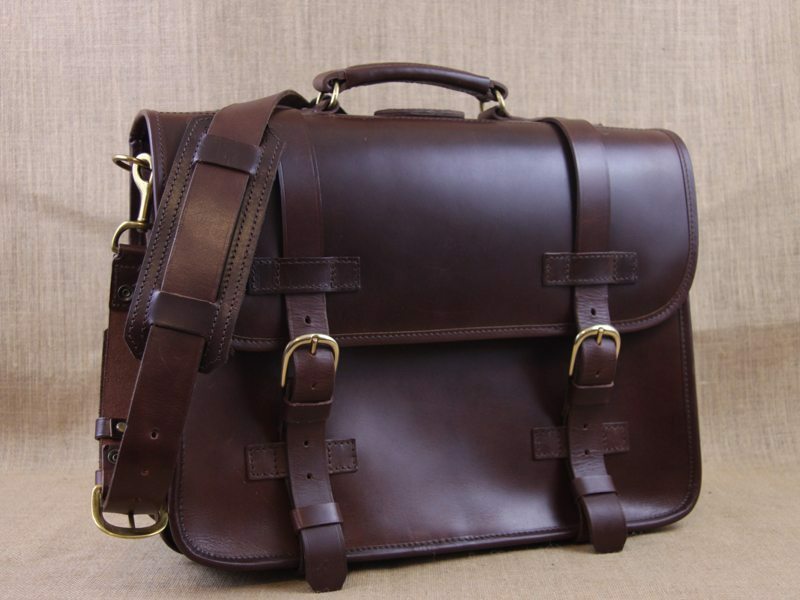 The LederMann Extra Large 18” Vintage Chestnut Belting Leather Briefcase is a beast – both in name and stature. It definitely lives up to its ‘extra large’ name. The body of this chestnut colored bag (also available in black) is made from 4-5 oz. full grain leather while the flaps and shoulder strap are 7-8 oz. in thickness. There are a lot of big pieces of leather sewn up in this bag. The precision stitching is comprised of heavy duty nylon thread while the interior of the bag is swathed in suede. Hardware is all brass and the stress points are reinforced with machine pressed heavy duty rivets. Everything about this bag is big. And, if you’re looking for a big that then you’ll be happy about that for sure. Spacious is the most accurate description of this bag, which is 18″W X 13″H X 7″D and has two inner compartments measured at 3.5″ each compartment. It affords plenty of room for a laptop (or two) of any size, your Xbox, games, and controllers (know this one by experience from my son), books, accessories, and clothes. There is a large slip pocket that runs the length of the back, suitable for a newspaper, magazine, or notepad (even a legal sized pad). The handle is thick and sturdy. The shoulder strap is wide and easy to adjust. It features two large, well-padded shoulder pads which is excellent for carrying heavy loads in traditional briefcase form or in backpack form. That’s right – this thing converts into a backpack using a traditional three point connection system. The strap easily comes apart and allows quick transition into shoulder straps. Again, the shoulder pads work very well in this arrangement. As an 18” bag, when loaded having the ability to carry this bag in backpack mode is a very nice feature. If you are looking for a bag to carry a fully equipped office with you – this is it. Need a bag to carry your basic office needs and your needs for a night or two? This is it. It’s big, but it’s versatile. It will test you though. Empty this bag weighs in at around approximately 8 pounds. When you load it up, it’s going to require some effort to transport it. But, its size also lends itself to staying in proportion with people of larger stature too. At 6’5” tall, this bag fits my middle son and me well. As a backpack or a messenger it doesn’t look out of place. As a combination office and overnight bag, it’s ideal because it will easily accommodate our larger clothes. The classic lines of this bag make it very attractive. The gussets, fine leather, heavy duty hardware all combine to create an elegant, classic look. It’s just bigger than most of the other bags in this style that you’ve seen in the past. The leather has a high gloss, waxy finish to it and looks very attractive. It certainly garners attention when you set it down at a meeting. It can’t help but be noticed. I recently read an article about a gentleman who spent one year traveling the world with everything he needed safely tucked into a 26 liter backpack. If you’re thinking of doing the same thing, this backpack is slightly larger than that and fully capable of serving you in the same capacity…and it will look much better than a nylon bag! I look forward to seeing how this bag ages and performs as time goes on. It was a little rigid right out of the box, but with limited use over the past six weeks or so it has already softened up. It’s a well made bag and should withstand the rigors of daily use without issue for decades. The $445 price tag for the LederMann Extra Large 18” Vintage Chestnut Belting Leather Briefcase is substantial – but so is the bag. And, it’s a multipurpose bag that you’ll be able to use and enjoy the rest of your life. 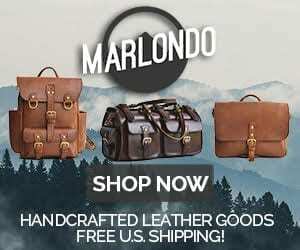 1 Comment on "LederMann Extra Large 18″ Vintage Chestnut Belting Leather Briefcase – $445"